What will pink eye cost you this year $$$? It's never too late to buy a Fly Killer Kover. Stainless steel and plastic construction. NO RUST! To order, please email or fax 785-363-2117 and send a copy of your check. Complete Unit: The Fly Killer Kover mounted on a Mann Poly mineral feeder. Yearlings using The Fly Killer Kover on a Mann Poly mineral feeder. Customer furnishes lifting chain. Ideal for use with pickup bale movers. Can be added to Bull Master and Fly Killer Kover Mineral Feeders. Replaces acorn nut. The Fly Killer Kover will prevent your cattle and livestock from getting face fly and pink eye problems using a pour-on or spray insecticide recommended by the manufacturer for back rubber application. We also believe that salt collecting on the felt surface falls into the eyes of livestock causing them to tear. This flushes out the eyes and kills pink eye bacteria. For an organic producer, we recommend an Agri-Dynamic's Ecto-Phyte. For more information, contact Agri-Dynamic at 877-393-4484. Warning: Do not use grubicide or a systemic insecticide with The Fly Killer Kover. Adapter kits are available for Applegate, Bull Master, Behlen, Brower, Sioux, Vigortone, and Vita-Ferm three compartment, poly, mineral feeders. 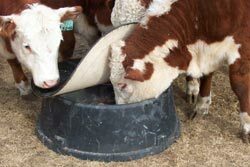 The unit will also provide your cattle and livestock with horn fly, lice, tick and mosquito control using Gordon's Livestock Backrubber and Pour-On (available at Tractor Supply stores). This is a premixed, ready to use 0.25% permethrin, safe on beef and dairy cattle. Just pour the insecticide into the one quart reservoir centered on top of the kover and your fly control program has just been launched. The insecticide empties from the reservoir in less than 24 hours, saturating the felt. Refill the reservoir weekly or as needed. If you get a lot of drippage of insecticide off the outside edge on the ground, try filling the reservoir less often or not as full. 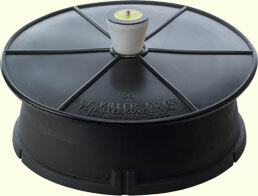 The kover is a 38 inch diameter urethane weathershield with a 1/4 inch thick polypropylene felt disc bonded to the underside. Mineral in the 150# capacity Mann Poly feeder entices the livestock to nose under the kover and thus the face, head area and shoulder contact the insecticide saturated felt and are self treating themselves almost daily. This unit must be the only source of mineral. You can raise the kover upward to add mineral by grasping the tab on the edge of the kover. Do not overfill mineral. Livestock should reach down into the feeder to get maximum coverage on head and face. To use block mineral, break the block into softball size chunks. We recommend up to 30 cow calf pair or 40 yearlings per unit and provide effective fly control. Satisfaction guarantee: We will replace broken or defective parts within 1 year of purchase date with a verifiable damage report. If you are not satisfied with the unit upon receipt, please immediately return the unit in new condition for a full refund. For dealer pricing, please call 785-363-2655. © Denton Designs, LLC. All Rights Reserved.